Introduction: Enteral access for nutritional support after gastric bypass is a challenging problem due to dense postoperative adhesions, difficulty in gaining endoscopic access to the excluded stomach, and the thick abdominal wall in an obese patient. Open techniques can be technically difficult and associated with high morbidity. 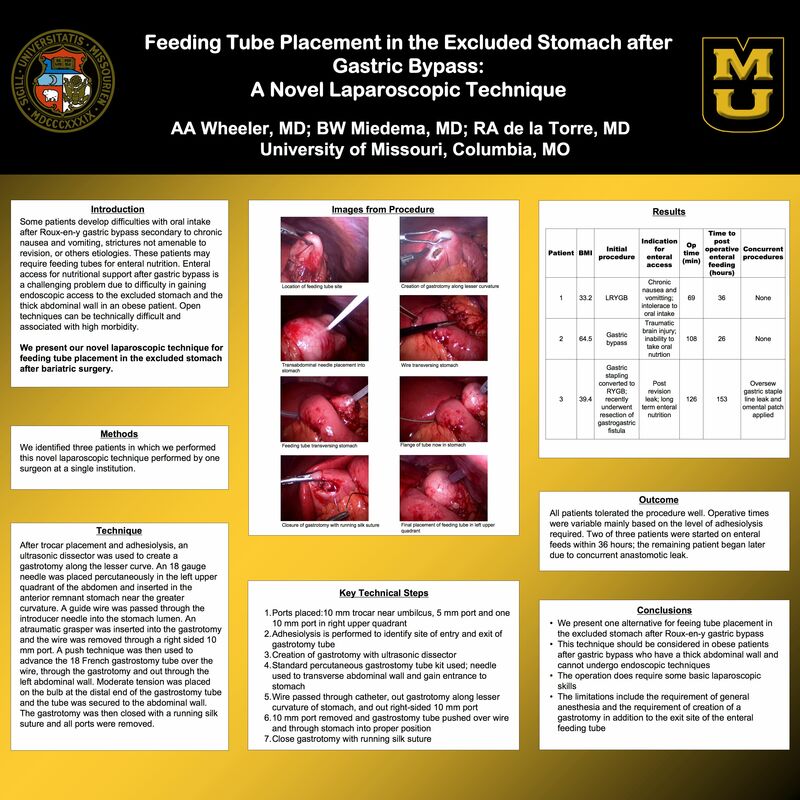 We present our novel laparoscopic technique for feeding tube placement in the excluded stomach after bariatric surgery. Methods: After trocar placement and adhesiolysis, an ultrasonic dissector was used to create a gastrotomy along the lesser curve. An 18 gauge needle was placed percutaneously in the left upper quadrant of the abdomen and inserted in the anterior remnant stomach near the greater curvature. A guide wire was passed through the introducer needle into the stomach lumen. The wire was grasped with an atraumatic grasper inserted into the gastrotomy and the wire was removed through a right sided 10 mm port. A push technique was then used to advance the gastrostomy tube over the wire, through the gastrotomy and out through the left abdominal wall. Moderate tension was placed on the bulb at the distal end of the gastrostomy tube and the tube was secured to the abdominal wall. The gastrotomy was then closed with a running silk suture and all ports were removed. Results: Patient data is shown in the table below. Patient 3 also had an omental patch of a staple line leak. There were no complications. Conclusion: We describe our experience with a novel technique for obtaining enteral access in patients after gastric bypass when other standard techniques for placing enteral feeding tubes are difficult or impossible.